Often people tend to think their memory is the best; however, when we are juggling multiple projects at once we tend to forget small details. For this reason, having a planner on hand allows you to be more organized and efficiently prioritize projects. House of Doolittle has a series of planners with unique designs. The Earthscapes Gardens of the World Weekly/Monthly Planner is most suitable for those who needs an organized schedule. The planner has a professional look with its suede-like cover and is soft to the touch. Also, it has distinctive gardens of the world on each week and month. The wire-bound planner makes it easier to flip through notes and find a certain time spot. Another unique feature is that planner paper is made from recycled paper. The planner has a large amount of note writing space. There is a two-page spread for each week. Plus, there are hourly appointments from 8:00 am to 5:00 pm on the planner where you can break down your daily schedule. If you need an overview of the month, you can view it on the right corner of the planner. HOD weekly/planner allows you to refer to the prior, current, and the following month calendar on each week. What is there to not like about this planner? It is sleek and it allows you to plan your weekly and monthly schedule down to each detail. Have you used this weekly/monthly planner? Let us know what you think. When it comes to staying organized, many people turn to their personal calendars or planners to store all of their vital information. Whether it is used for work, home or contains information for both, the planner becomes a vital tool that holds a lot of valuable material. For those who like to use one planner to document everything, House of Doolittle has the Weekly Expense Planner that is able to store a lot of information. The 12-month calendar is bound and protected by a professional black leatherette cover. Each month is broken down into weeks in order to allow room for detailed notes. Each day block is ruled and broken down into appointment times, ranging from 8:00 am to 5:00 pm. Weekends are highlighted in different colors to separate it from the traditional workweek. In addition to the weekly calendar, there is an expense table that allows individuals to record what was spent on various things, such as breakfast or gas mileage. The Weekly Expense Planner makes tracking expenses in combination with maintaining scheduled appointments an easy thing to accomplish. Individuals will have all the information in one central place, making it easy to reference the data in the future. What would you use this planner for? Let us know below. This professional-looking planner is able to store a great deal of information for both work and professional life. Many jobs require employees to maintain an expense log in order to track how and why they are spending the company’s money. Documenting expenses can become time consuming if the individual does not track it on a regular basis. House of Doolittle offers a unique calendar that allows expenses to be tracked. 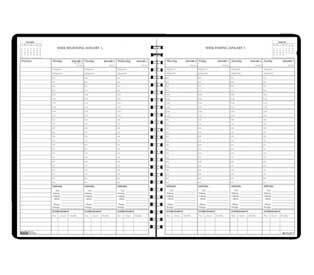 The Weekly Planner with Expense Log is helpful within the work place and especially for employees that may travel regularly or are part of the sales staff. Each week has its own two-page spread that has half-hour appointments from 8:00 am to 8:30 pm. Not only can you track meetings throughout the week, but there is also an expense log and entertainment log for each week. The calendar, which is printed on 100% recycled paper containing post-consumer waste with soy inks, display each day in a vertical column. There is a convenient monthly reference calendar on every week. Having one place to search for appointments and expenses can be beneficial to employees. How would you use House of Doolittle’s Weekly Calendar? Let us know! Track expenses on a daily basis as you monitor your schedule and upcoming appointments. You are currently browsing the archives for the Weekly Appointment Planners category.